Small Beer Press, 9781618731531, 288pp. In the tales gathered in An Agent of Utopia: New and Selected Stories you will meet a Utopian assassin, an aging UFO contactee, a haunted Mohawk steelworker, a time-traveling prizefighter, a yam-eating Zombie, and a child who loves a frizzled chicken--not to mention Harry Houdini, Zora Neale Hurston, Sir Thomas More, and all their fellow travelers riding the steamer-trunk imagination of a unique twenty-first-century fabulist. From the Florida folktales of the perennial prison escapee Daddy Mention and the dangerous gator-man Uncle Monday that inspired "Daddy Mention and the Monday Skull" (first published in Mojo: Conjure Stories, edited by Nalo Hopkinson) to the imagined story of boxer and historical bit player Jess Willard in World Fantasy Award winner "The Pottawatomie Giant" (first published on SciFiction), or the Ozark UFO contactees in Nebula Award winner "Close Encounters" to Flannery O'Connor's childhood celebrity in Shirley Jackson Award finalist "Unique Chicken Goes in Reverse" (first published in Eclipse) Duncan's historical juxtapositions come alive on the page as if this Southern storyteller was sitting on a rocking chair stretching the truth out beside you. Duncan rounds out his explorations of the nooks and crannies of history in two irresistible new stories, "Joe Diabo's Farewell" -- in which a gang of Native American ironworkers in 1920s New York City go to a show -- and the title story, "An Agent of Utopia" -- where he reveals what really (might have) happened to Thomas More's head. 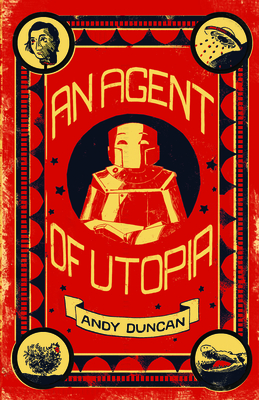 Andy Duncan's short fiction has been honored with a Nebula Award, a Theodore Sturgeon Memorial Award and three World Fantasy Awards. A native of Batesburg, S.C., Duncan has been a newspaper reporter, a trucking-magazine editor, a bookseller, a student-media adviser and, since 2008, a member of the writing faculty at Frostburg State University in the mountains of western Maryland, where he lives with his wife, Sydney.